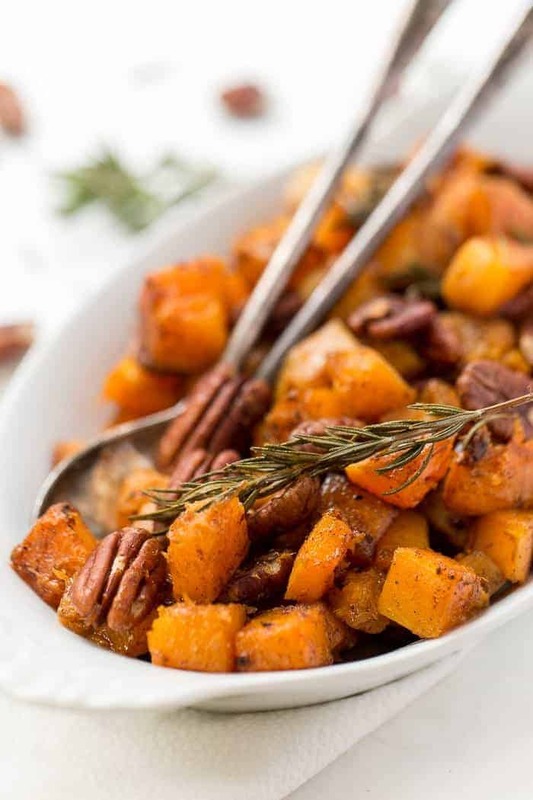 This Maple Roasted Butternut Squash recipe is the perfect holiday side dish! Uses just 7 ingredients, requires only one bowl and 40 minutes to make! When you're on the hunt for a good (and healthy) Thanksgiving side dish, and then you create one from scratch? Best feeling in the world! This year for Thanksgiving we're heading out to Colorado to spend the week with Matt's family. His sister is vegetarian, so she and I have decided to take over the menu, specifically the sides and desserts. His mom will be doing the turkey, but the rest we're handling (except Matt has decided he's contributing green beans!). 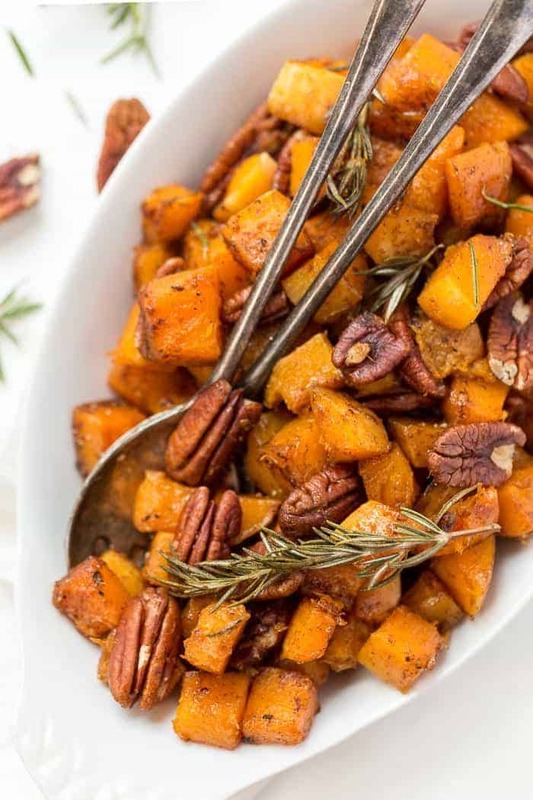 We're definitely thinking some sort of green salad, a quinoa salad, some whipped sweet potatoes (the ones from my Sweet Potato Vegan Shepherd's Pie) and definitely this maple roasted butternut squash! I've been wanting a new way to enjoy squash, one that I can even tempt Matt to eat, and when I tasted this dish, I knew it was it. Didn't even need a second test. It's that delicious! You're only going to need 7 ingredients, one bowl for this squash and 40 minutes (most of which is hands-off). Of course, if you've made butternut squash before, then you know the peeling and cutting is definitely the most time-consuming part, but if you watch the video at the end of this post, you'll see my method which is quick and easy! The “dressing” we're using on this squash is a combo of avocado oil, real maple syrup, cinnamon and a pinch of salt. Simplicity really is amazing! The avocado oil is great for high heat roasting and doesn't add any flavor. 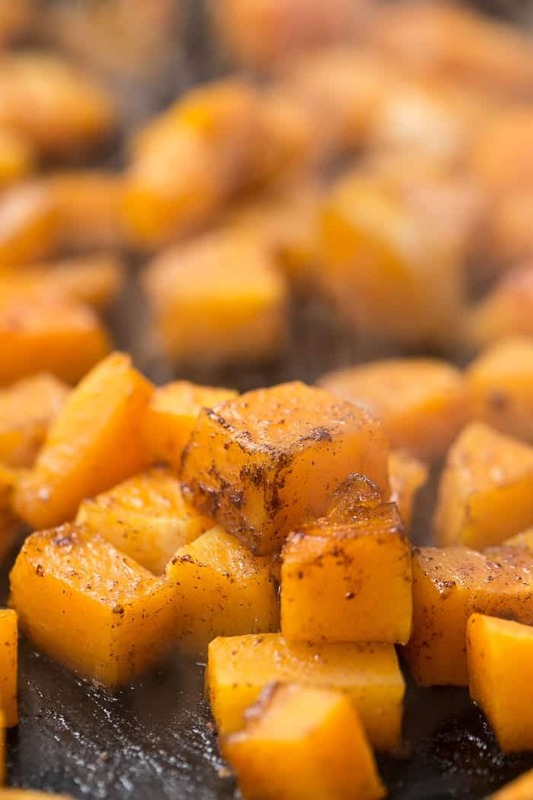 The maple syrup will caramelize as it cooks and helps get the squash nice and tender. The cinnamon is there to add warmth and a really rich flavor, and the salt just helps it all pop! So if you've been searching for a last minute side dish, look no further! 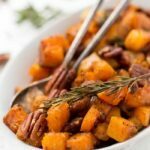 This maple roasted butternut squash will surely be a crowd favorite, it's the perfect complement to turkey and leftovers make an amazing breakfast! When you try this recipe, I'd love to see a picture ❤️ you can tag me on Instagram using @simplyquinoa or #simplyquinoa so I can easily find your photo and give you some love in return! Peel the butternut squash, then chop off the neck. Cut the neck into rounds, then dice into 1" pieces. For the bottom part, cut in half and scoop out the seeds. Set the seeds aside and chop into 1" pieces. 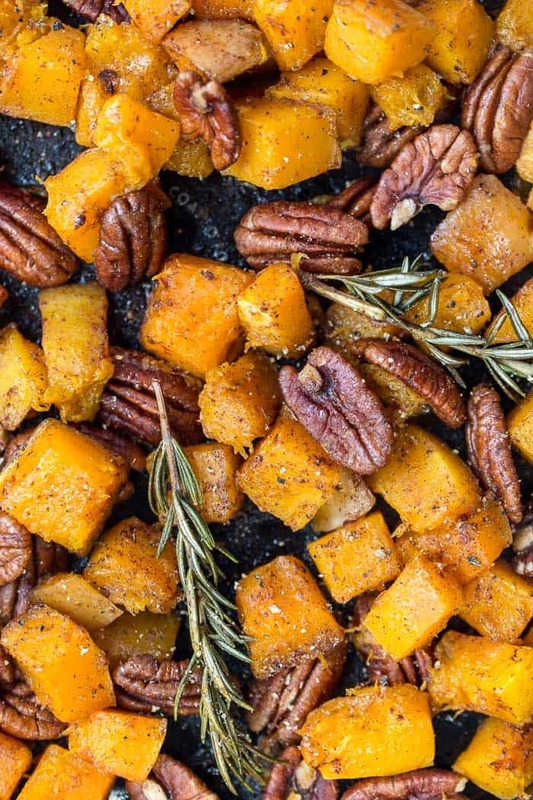 Place squash on a baking sheet. In a small bowl, whisk together the oil, syrup, cinnamon and salt together. Drizzle over the squash and stir to coat. Roast on the center rack for 2o minutes, stirring halfway through. Remove after 20 minutes and stir in pecans and rosemary. Place back in the oven for another 10 minutes or until the squash is fully cooked through. * this dish can also be made ahead and reheated in an oven safe dish at 300ºF. Can’t wait to try this dish! Thanks, Alyssa! Mmm…I love butternut squash. It’s so sweet as it but with the addition of the maple and pecans- like vegetable candy! Yes! It’s the absolute BEST! Such a lovely recipe! 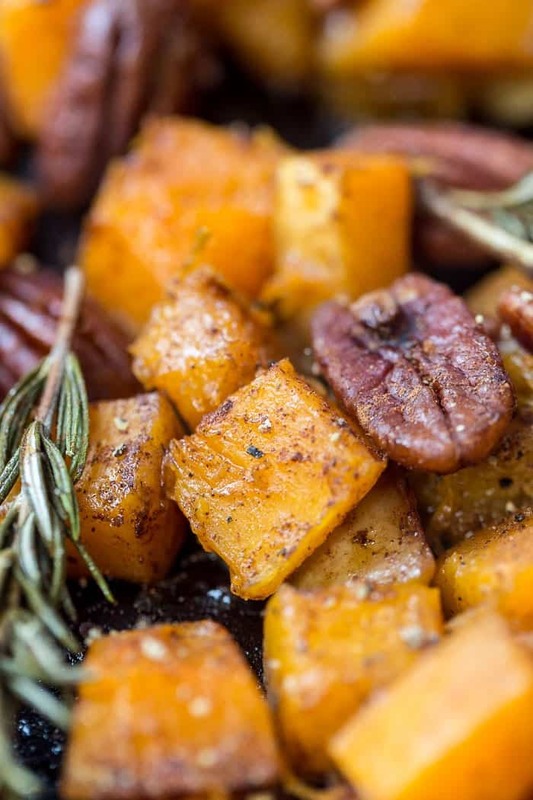 I had roasted butternut squash with a drizzle of maple syrup the other day, and it didn’t fail to disappoint! I do wish I roasted it marinated in the maple syrup like this instead of having them separately! 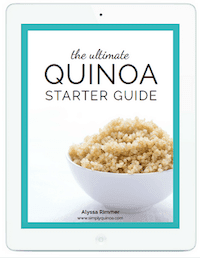 I bet the mix of savory and sweet flavorings in this recipe tastes incredible! I’m in Aspen and happy to hear that you’re spending the holiday in Colorado! Wherever you are in our beautiful state, ENJOY! !